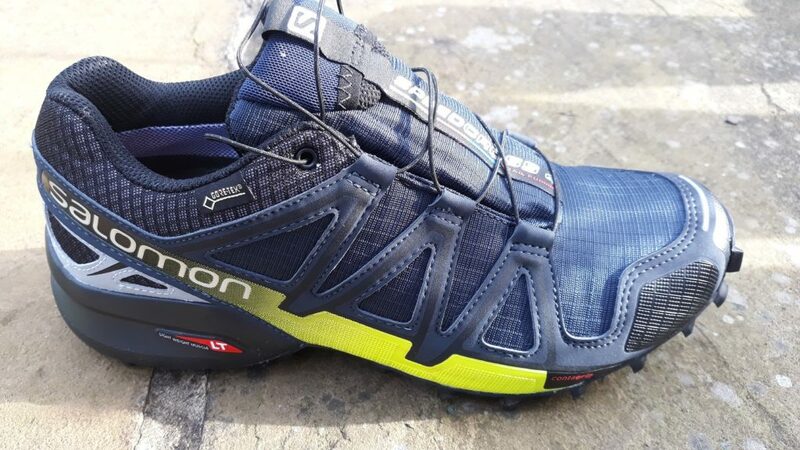 Salomon Speedcross are quite a well recognised shoe in trail running and fell running circles, here I look at the Speedcross 4 Nocturne GTX version. As with other Speedcross models the Speedcross 4 Nocturne is a neat looking shoe. It appears robust with a firm, water resistant upper, protective rand and sturdy toe bumper all of which give protection to the foot when running on loose, rocky terrain. The upper is double stitched rather than laminated / glued. I normally take a size 6.5 shoe and these 6.5s felt fine with a reassuringly snug fit. The shoe also offers a decent amount of cushioning with a midsole height of 30mm to 20mm giving a 10mm drop. The sturdiness of the shoe means that it isn’t the lightest on the market – my pair of size 6.5 tipped the scales at a fraction over 600g. 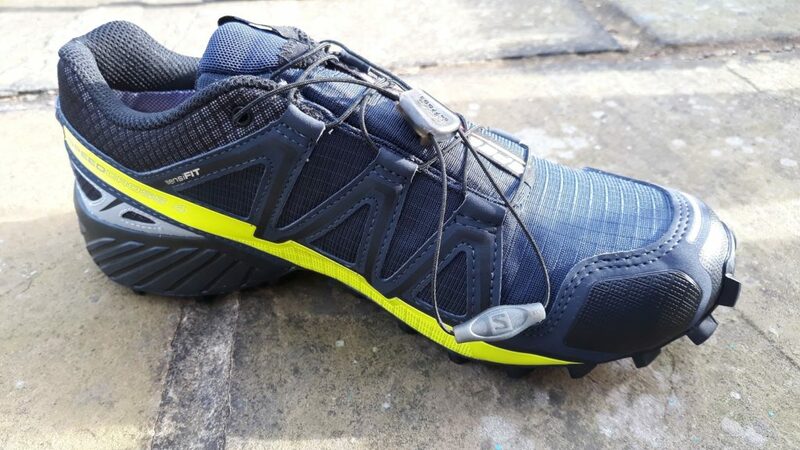 Salomon use their Quicklace™ system; the shoe is tightened by pulling the laces taught and sliding a fastener down then tucking the excess lace away into a neat little flap on the tongue. 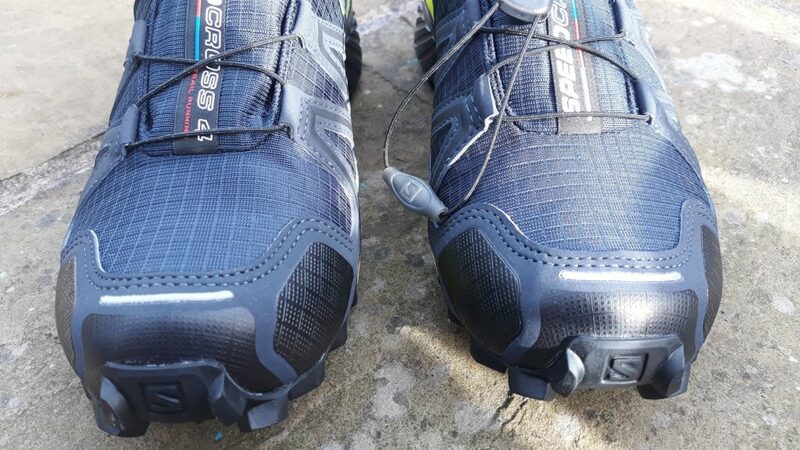 This system works well, I haven’t found the need to re-tighten the laces mid run and it makes the shoes easy to undo even with cold fingers. 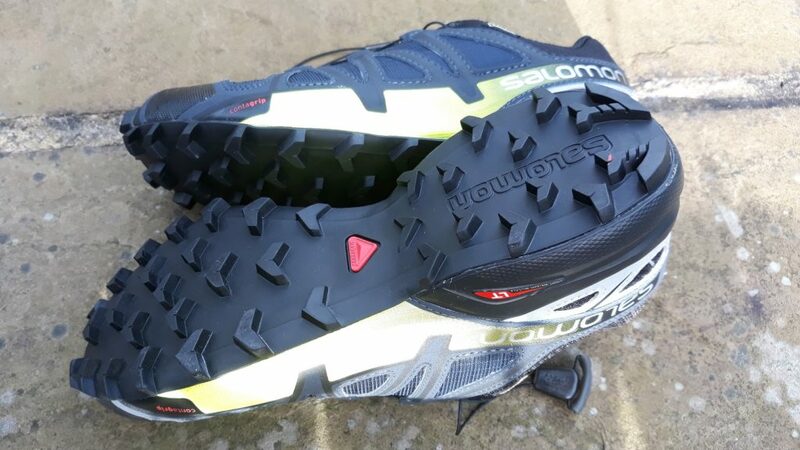 The outsole uses Salomon’s Contagrip® rubber and distinctive, aggressive chevron lugs which give good traction in wet and muddy conditions. The Nocturne version of the shoe are so called because they are made with reflective material on the uppers. This shows up very well in car headlights and is a useful safety feature especially if your night runs have sections of unlit country road. They are also very reflective in the light of a head torch which may or may not be good for someone running behind you at night. 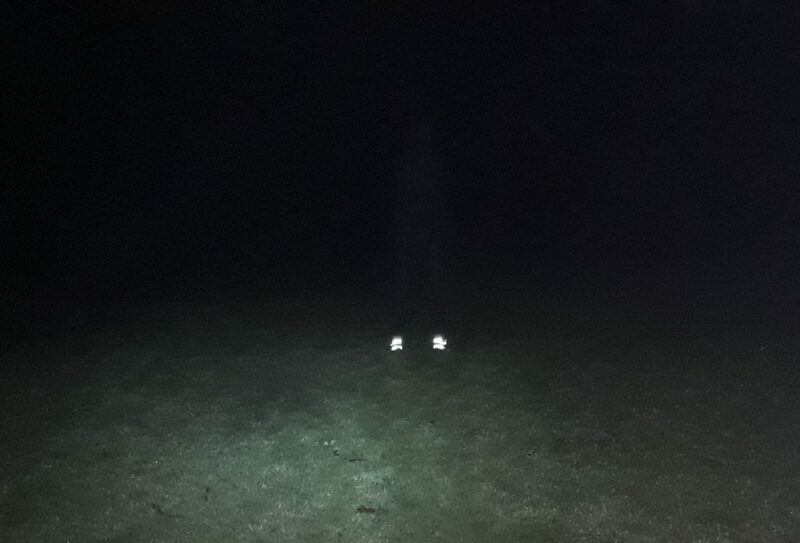 ghostly figure with reflective shoes! The main difference between these and the standard version of the Speedcross 4 is that these have a Goretex® membrane. This gives even greater protection to the feet, preventing water from soaking through the uppers. 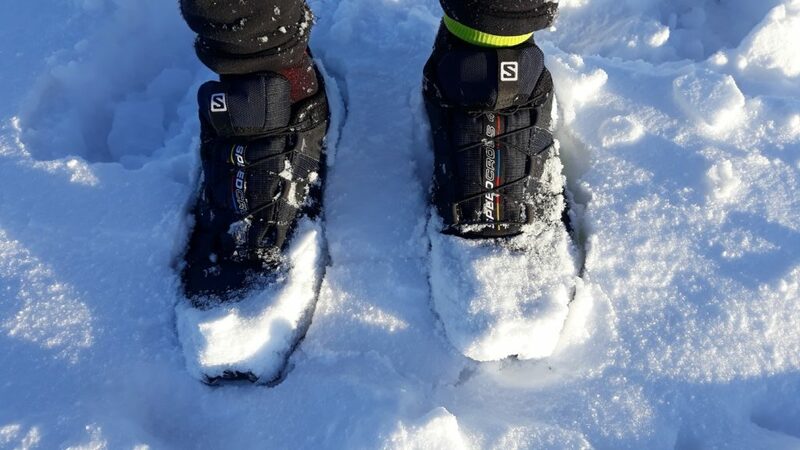 I tested the shoes over winter in both wet and snowy conditions and although not completely dry at the end of the runs my feet were a lot drier than if I’d been wearing standard shoes. I think the slight dampness I experienced was from sweat rather than from water getting into the shoe through the fabric. Some people dislike Goretex shoes because once water gets in it can’t drain away freely and also sometimes your feet can get too hot. However I think they can be useful if you use them in the right conditions. If you know that you aren’t going to be immersing your foot completely and so can prevent water getting into the shoe that way then I think they have a use. I found them to be useful in snow, especially with a gaiter to prevent snow getting in and they would be a good choice of footwear if running on grass on spring or autumn mornings where there is a heavy dew. I deliver a coaching session every week on a grass playing field where the grass is frequently wet and I’d often end up with cold, wet feet (wellies aren’t an option when you’re trying to demonstrate drills!) These are now my shoe of choice for these sessions. The shoes perform best in wet, muddy and snowy conditions. 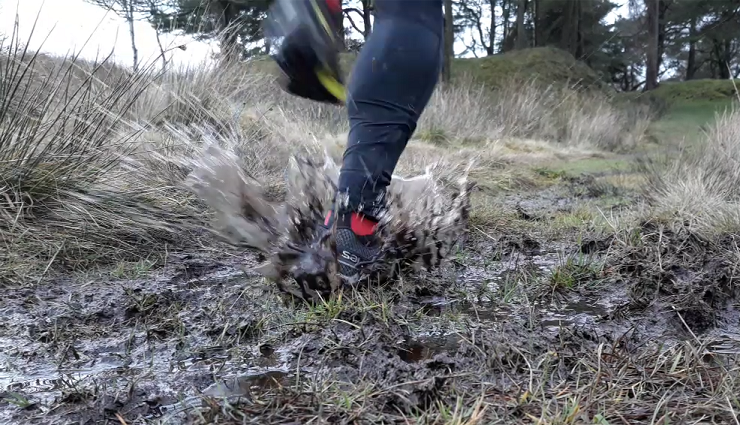 The grip is very good on mud and wet grass, however not as effective on wet rock – but what is!? Personally the 10mm drop is a little too much for my liking, I prefer something with less drop that feels closer to the ground, certainly for racing or fast training runs – however that is personal preference. The fit feels snug and the construction feels robust with plenty of cushioning and protection. The Goretex version lends itself to wet or snowy conditions (as long as it’s not so deep that it goes over the top!) whilst the Nocturne uppers allow you to be seen more readily at night. 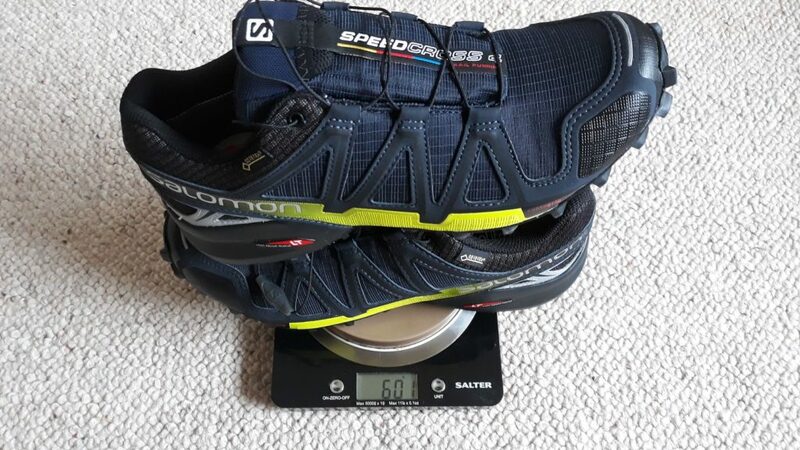 Posted in Reviews, Shoes and tagged Salomon, Speedcross. I’m interested to know how these have stood up to long term testing and if you still recommend them? They have stood up well so far although to be honest I haven’t really done that many miles in them this year. I tend to use them for coaching sessions on wet grass plus the occasional trail run. I have noticed that my feet get damp after a while, not sure if that’s sweat or water seeping in. I’d recommend them if you can justify having several pairs and they are definitely good in snow but they wouldn’t be my main pair of fell shoes.